President Trump: Community College is 13th Grade, Not Real College -Fiction! - Truth or Fiction? President Trump: Community College is 13th Grade, Not Real College -Fiction! President Trump: Community College is 13th Grade, Not Real College –Fiction! 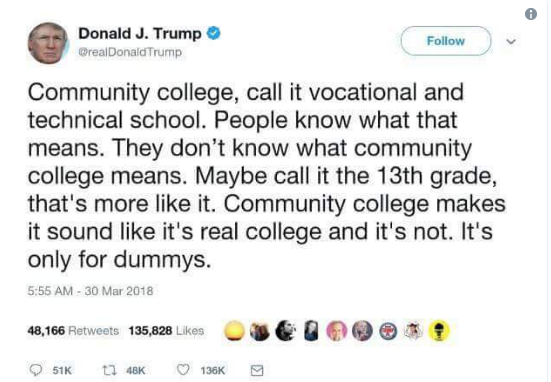 A tweet from President Trump calls community college 13th grade and asserts it’s not real college and is for dummies. It’s easy to photoshop or manipulate tweets that appear to show politicians saying ignorant or outrageous things. This appears to be one of those cases. The tweet doesn’t appear in the president’s timeline. It’s also absent from the “Politiwoops” archive of deleted political tweets run by ProPublica. So, Trump didn’t say that community colleges are like “13th grade” or are for dummies. But he has taken issue with the name “community colleges,” preferring vocational and technical college instead. Facebook Users Entitled to $17,500 for Facebook Data Leak-Mostly Fiction!